Every so often, something happens in the indy scene that is worth celebrating. 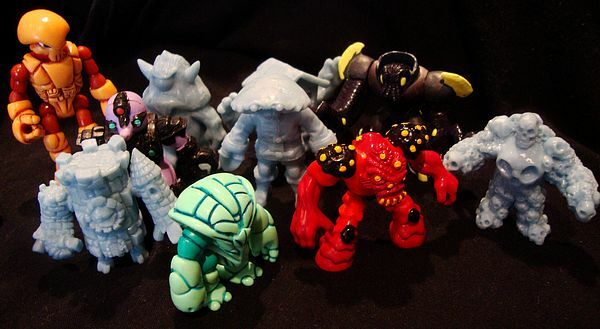 Indy and designer toys have become big business lately, with lines ranging from Mighty Muggs-esque "paint your own' blank slates, to bigger lines like Glyos System, which is just as good as anything the major companies put out. 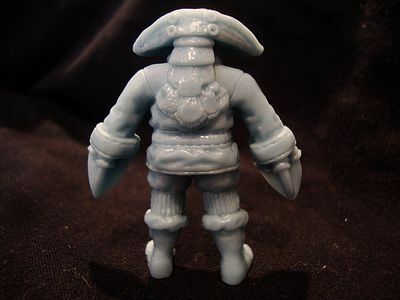 OMFG, short for Outlandish Mini Figure Guys, is unique because of how it was developed. Conceived by George Gaspar, the line has been almost entirely fan-produced - funds were raised via Kickstarter, figures were designed through a forum poll, and the entire thing has involved fans from day one. And then, as icing on the cake, the figures themselves are of excellent quality, with plenty of exclusives going to smaller stores - rather than Wal-Mart or Toys R Us or even Big Bad Toy Store, these exclusives have come through places like Onell Design or Little Rubber Guys. Fantastic! Black: Special Kickstarter pre-order bonus only. No longer available, so good luck finding those. These sites are all run by awesome guys, so give them your business! With that done, let's get on to the review! Each individual seller has their own OMFG packaging. Onell Designs sells in a baggie with a card, whereas Little Rubber Guys has its own full blister. This is purely up to personal preference, and some of the packaging is not yet known. Hence the lack of a score. Either way, all revealed packaging shows off the figures nicely, and has nicely-customized art. Onell pixellates them like NES characters, whereas Little Rubber Guys has a massive piece of art of the figures playing with MUSCLEs! 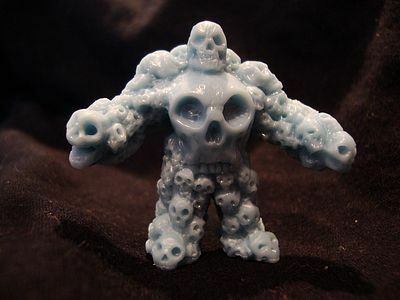 Multiskull - Designed and sculpted by Charles Marsh (aka Monsterforge) from South Carolina. This is already a fan favorite, and no wonder! The sheer amount of detailing on this little guy is astounding! Crawdad Kid - Designed and sculpted by Daniel Yu (aka Dory) from Singapore. Although the name brings to mind a cowboy, Crawdad Kid has more of a pseudo-1930s-era soldier look, perhaps with bits of art deco or dieselpunk. Quite intimidating! 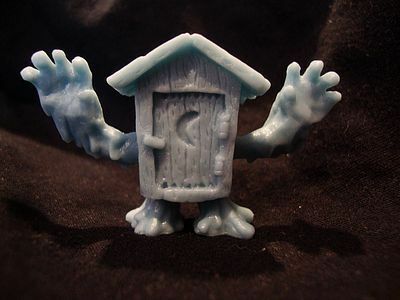 Phantom Outhouse - Designed by Kyle Thye from Iowa and sculpted by Ralph Niese from Germany. 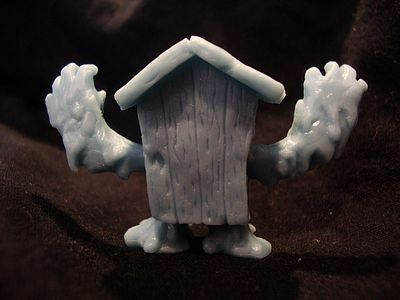 Phantom Outhouse has an alternate name, which shows up on some promo material. Let's just say it's not appropriate for children. 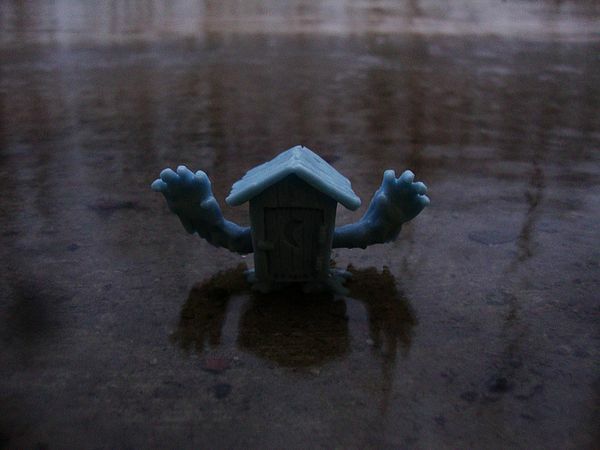 The Phantom Outhouse, however, is hilarious, and excellently-sculpted! And it also leaves a little up to the imagination - a few people have painted the arms as water! This figure also fits in with quite a few MUSCLEs, since that line contains two urinals and one roll of toilet paper. King Castor - Designed and sculpted by Dominic Campisi (aka The Evil Earwig) from California. 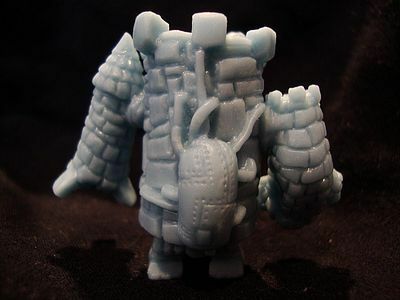 King Castor is a fantastically-detailed castle monster/robot, with lots of little bits and pieces that you won't notice until you've studied it for a while. Fantastic work! Stroll - designed by John "Spanky" Stokes from California and sculpted by George Gaspar from California. 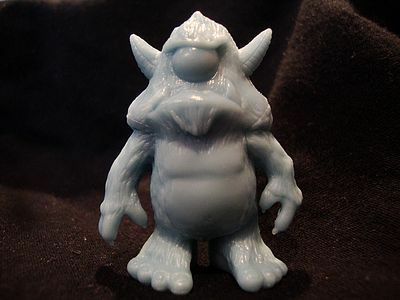 A cyclopean troll creature, Stroll would fit right in harassing your Troll dolls - he even has a bare behind! It should be noted that it LOOKS like he has an artist's signature on his rear, but according to the sculptor, that's actually a Spanky Stokes tattoo! 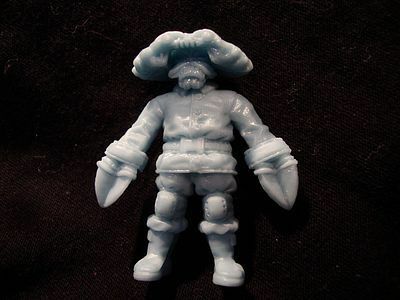 -Certain figures are constructed from more than one piece of plastic. It's really only noticeable with Stroll's arms. -Stroll's eye is completely blank, meant to be painted. But this is not a problem, either. 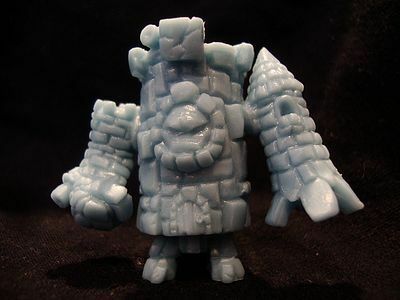 The plastic is sturdy and reminiscent of MUSCLE plastic (it's actually the same stuff that Glyos and Z.O.M.B.I.E.S. are made from0, and should hold up to play. The figures are roughly MUSCLE-size, but not entirely - most but not all are taller, for example, and all are thicker. 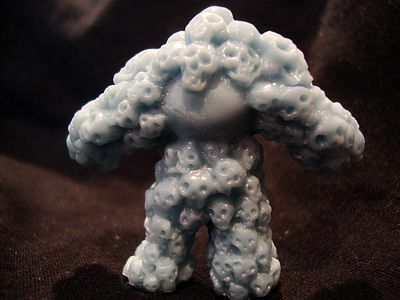 These sculpts have depth, and even a little weight! My hat is off to the whole production team! Minifigure line, remember? The lines that this line is a tribute to are unarticulated. I say "varies" because they are not true accessories - donating to Kickstarter could net you t-shirts, posters, and all sorts of cool stuff. Little Rubber Guys has a poster offer (with two different posters), Onell Designs has an online comic, and who knows what else may be in store? Designer toys tend to be expensive. 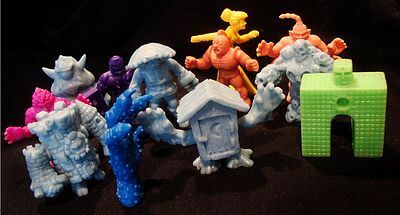 For these, you're looking at $15.00 for 5 figures - that's $3 per Indy toy! Many well-loved independent manufacturers will charge $15-$30 for a single figure of this size! And again, some exclusives come with extra materials. 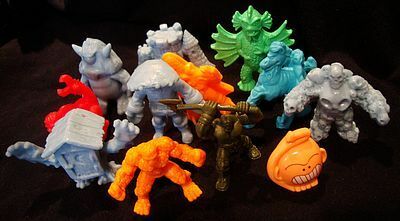 The glue on the multi-piece figures will hold just fine, but of course these could be choking hazards. Also, keep in mind that Phantom Outhouse's alternate name is pretty visible on the regular poster and title card, so watch out for it! But other than that, these are perfectly child-friendly. This is a fantastic effort by fantastic people, and I cannot compliment it enough. 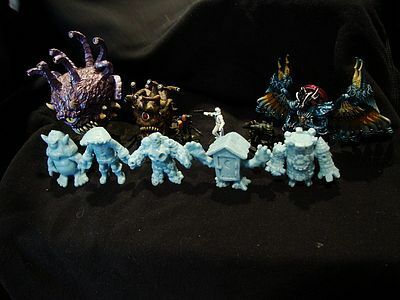 Head on over to October TOys' forum to check out the design submissions for OMFG Series 1, and help keep this line alive! It's rare when something this awesome happens in any indy scene, and I am glad that this one came along. See above. You will want to get these from the original manufacturer or the exclusive vendors. 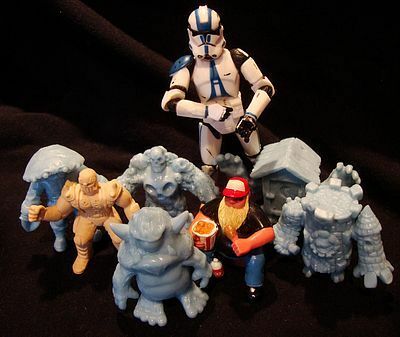 Please support your local indy toy producers! I personally either have ordered or plan to (when available) two of each colorway, including the black. I am absolutely satisfied with my Onell colorways, and hope to see more goodness soon! This product was purchased for the review by the reviewer. Photos and text by Rideruyi.